In response to British plans to fortify the hills surrounding Boston harbor, colonial forces besieging Boston occupied Bunker Hill and Breed’s Hill on the Charlestown peninsula, north of Boston. On June 17, 1775, British troops repeatedly attacked colonial defenders and suffered substantial casualties. The British eventually succeeded in forcing the colonists to retreat to Cambridge. 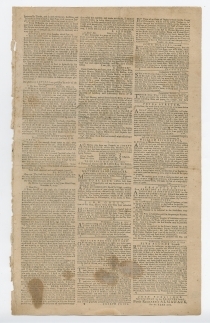 When news of the battle reached London, King George III responded with “A Proclamation for Suppressing Rebellion and Sedition” on August 23. Colonial Secretary Lord Dartmouth (1731-1801) drafted the Proclamation. Dartmouth had received a copy of the Olive Branch Petition, signed by the Second Continental Congress on July 8, 1775. Because the King refused to receive the Olive Branch Petition, this Proclamation was effectively his answer to that plea. On October 27, the King expanded on the Proclamation in his Speech from the Throne at the opening of Parliament. In that speech, the King declared that a “desperate conspiracy” of leaders were pressing for independence despite insincere claims of allegiance to him. He indicated that he would respond to the crisis with armed force. The King’s Proclamation of August 23 and his Speech to Parliament of October 27 effectively undermined the moderate hope in the Second Continental Congress that the King would resolve the dispute between the colonists and Parliament and took that body a step closer to declaring independence. 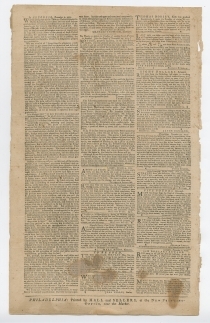 On November 13, 1775, the Second Continental Congress appointed a committee “to prepare a declaration, in answer to sundry illegal ministerial proclamations that have lately appeared in America.” The committee consisted of Richard Henry Lee of Virginia, James Wilson of Pennsylvania, and William Livingston of New Jersey. 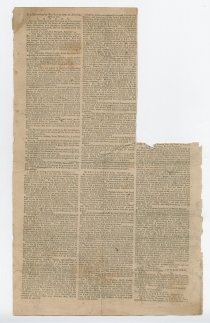 The “illegal” proclamations likely included the King’s August 23 proclamation. On November 29, the Committee on Proclamations made a report to Congress, and the report was laid on the table “for the perusal of the members.” On December 6, 1775, Congress debated the report by paragraphs and agreed to it. 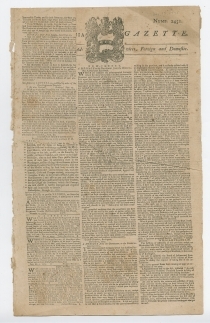 This issue also includes William Franklin’s “Message from the Governor to the New Jersey Council” (December 6, 1775) (p1/c2-3); four Letters to John Hancock from Philip Schuyler (Ticonderoga, November 22, 1775), Richard Montgomery (Montreal, November 17, 1775), and Benedict Arnold (St. Maria, November 8, and Point Levy, November 14, 1775) (p3/c1-2); and Lord Dunmore’s Militia Orders for November 24, 1775, enacting his Proclamation of November 7, granting freedom to enslaved men who join British troops (p2/c3).